On November 17, 2015, the Auschwitz Institute for Peace and Reconciliation, and the Benjamin N. Cardozo School of Law hosted a launch event for the release of Reconstructing Atrocity Prevention, an edited volume on the field of atrocity prevention. Hosted by Cardozo Law, the event featured a panel of the book’s contributors and significant involvement from the audience, which included many prominent actors in the field. The monumental work, published by Cambridge University Press, was built on the framework provided by a September 2013 conference entitled“Deconstructing Atrocity Prevention”. The book was edited by AIPR’s Executive Director Dr. Tibi Galis, independent scholar Alex Zucker, and the late Sheri P. Rosenberg, Founder and Director of Cardozo Law’s Human Rights and Atrocity Prevention Clinic and AIPR Board Member. The volume features a foreword by Lieutenant-General Roméo Dallaire and is comprised of 20 individual chapters by authorities in the field and covers topics ranging from the role of social psychology to the mobilization of economic sanctions and the role of public activism in preventing mass atrocities. The book is intended to function as an “authoritative work on the state of the field” by providing a comprehensive snapshot of our contemporary understanding of prevention. 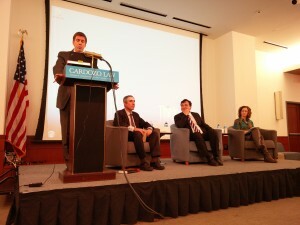 The evening’s event was opened with an introductory address by Richard Bierschbach, Vice Dean at Cardozo Law. The discussion panel, which followed Mr. Bierschbach’s remarks, was made up of Dr. Tibi Galis, Mr. Mark Zucker, and moderated by Dr. Bridget Conley-Zilkic, Research Director of the World Peace Foundation and Assistant Research Professor at Tuft University’s Fletcher School for International Affairs. Each of the three panelists gave their thoughts on the process behind the compilation and significance of the book and briefly delved into specific passages before the audience was invited to raise questions about contemporary mass atrocity prevention. Reconstructing Atrocity Prevention is available on Amazon and directly through Cambridge University Press.